Argos is part of the Home Retail Group, the UK’s leading home and general merchandise retailer serving 130 million customers a year through its network of 740 stores. Argos, traditionally a British catalogue retailer, and now an omnichannel retailer, has been further innovating their unique model through the creation of their digital stores. Within these stores, their customers use tablet devices fixed to desks to browse the Argos catalogue, select the items they wish to purchase and then head to the tills to pay before collecting their products. With a unique customer journey to most retail stores, Argos needed to ensure the journey was streamlined for all customers using all channels when purchasing their products. To enhance their digital stores, they wanted to do this in an innovative way and chose to collaborate with Qudini as an innovative partner. 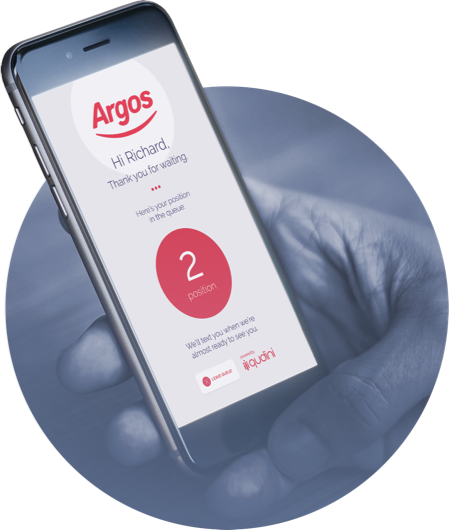 Argos implemented the Qudini virtual queue management system with digital display & pager devices. At the point of sale, customers had the option to provide their mobile number to receive an SMS update about when their order will be ready, or to take a physical pager device that will vibrate to alert when their order is ready. Staff become more efficient in the stock room with access to a tablet interface, where they can mark the orders that have been completed. Qudini made the process more simple and transparent for the customers. This improved their experience and created a better relationship between customers and staff. Safe in the knowledge that they would be called when it was their turn, more customers relaxed and engaged with the store’s display products or tablet browsers whilst they wait. In peak periods, staff felt significantly calmer and less stretched now that customer expectations were managed digitally. The system enabled staff to serve customers better and more efficiently in less time. 90% of staff agreed that Qudini improved their customer’s perception of the Argos brand as a brand that is digital, innovative and customer service led.